The UK's highest zip line and longest alpine coaster are being planned for a hillside on the edge of Edinburgh. They are part of proposals to turn Midlothian Snowsports Centre at Hillend into a year-round, multi-activity leisure development. The project, if given the go-ahead by councillors, could also include a new reception building, food court, shops, activity dome and glamping wigwams. 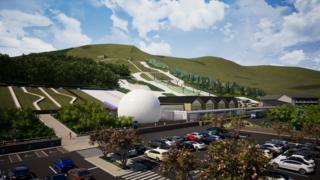 There are also plans for a hotel and freestyle jump slope extension. An alpine coaster is a type of roller coaster with bobsled-like cars on tracks installed on a mountain. Derek Milligan, Midlothian Council's cabinet member with responsibility for sport and leisure, said: "We're very excited about the potential leisure and economic benefits an expanded year-round facility at Hillend could bring to the local area. "If given the go ahead, not only would the investment pay for itself, but it could generate additional income that would be invested back into council services such as education, health and social care. The project could also create 50 full time jobs. "We think enhancing the current facilities with the highest zipwire in the UK, the longest Alpine coaster and the indoor climbing and soft play will attract families from all over the country and beyond. "While the plans are just proposals currently, we are looking for feedback from local people to help shape our future planning application. Given the budget challenges we are facing, we also want to be certain of the solid business case behind these ambitious plans before giving the final go-ahead." The public can drop in to the centre between 14:00 and 19:30 on Monday 28 January 2019 to find out more about the project, which is called Destination Hillend. Councillors are due to decide on Destination Hillend in early spring.